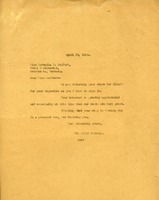 Letter to Cornelia E. Bedford from The Berry Schools informing her that her check is being returned to her because she failed to sign it. They thank her for her interest in the school in their time of need. They also wish her a good stay in Germany. 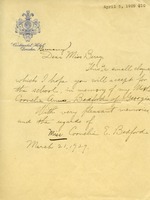 Miss Bedford writes to Martha with a small check to the school in memory of her mother.